Yesterday in the Zimmerman Trial preceding, the mood became very dramatic as the judge walked out of the courtroom and the state and defense attorneys attacked each other, breaking court protocol. 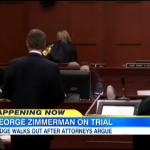 After hours in court, George Zimmerman’s attorneys accused the state of withholding information and lying to this court. John Guy, the assistant state attorney, offered to allow the defense to apologize. The arguing went on for so long that eventually the courtroom lights went out. Eventually Judge Deborah Nelson called a recess and walked out on the court, as the attorneys continued to argue. Dan appeared on Good Morning America this morning to discuss whether the introduction of the new evidence by the defense is going to really effect this case. Dan says, “It’s admirable that the judge is taking this late and saying we have to get this going. I think Matt brings up an interesting point, about whether the jurors have already made up their minds. I don’t think there’s any question that the jurors want to get back and deliberate. They haven’t been able to talk about the case with each other. They’re itching to get back there and say, all right. Let’s start doing this.” Watch the segment here.